Another highpoint of community initiative and a great tourist magnet, the dry river regatta Henley on Todd, in its 54th year, will engulf Alice Springs tomorrow. It’s preparation is a year-round initiative for the town’s three Rotary clubs. Every day of this week members, sponsors, 25 prisoners, a group from the US Det 421, town council workers and many others were setting up the arena in the bed of the river, and facilities on its western bank (pictured yesterday) for the 4000 spectators expected. Tomorrow 120 Rotary members, their families and friends will be staffing the event, starting at 10.30am with a parade through the Mall, setting off from the council lawns. 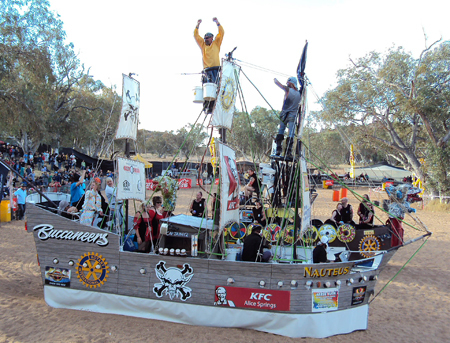 As always Henley on Todd will climax with the sea battle of the three ships, Buccaneers, Vikings and the Navy, after a day of heats in bottomless boats, canoes on rails and other seafaring vessels – with not a drop of water in sight. It will be another triumph for the volunteer spirit in Alice Springs – and elsewhere: This year a man from Hong Kong answered the call for helpers. Battling Trachoma is the major objective of the charity event this year.